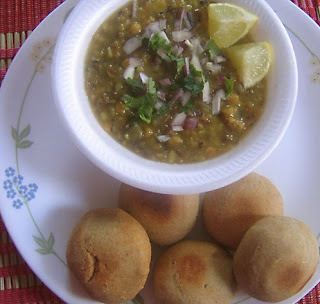 Baati served with daal churmais a famous Rajasthani speciality. Baatis are stiff balls of dough cooked on charcoal or ash served with a generous helping of ghee. The accompanying Daal (lentil) dish is spicy and delicious, usually made with a mix of five lentils. There are a variety of ways you can make the daal and Baati. Here i will show two such methods of preparing dal baati. Red chilli powder - 2 tsp. Knead a soft dough with flour, ghee, curd, salt and just enough water. Cover and keep for one hour. Then roast in batches on hot coals till puffed and golden outside and spongy inside. Soak rajma and Urud dal in water overnight. Pressure cook rajma and black gram till it becomes soft. Heat 4 tbsps oil. Add onions. Brown them. Add ginger-garlic paste and tomatoes. Fry them for a minute. Add all the masalas, beans and salt. Pour over cream and ghee. Garnish the dal with coriander leaves and slit green chillies. Mix the flour, rawa, salt and ghee. Knead into a very stiff dough with warm water. Shape into lemon size balls. Heat a gas tandoor or oven and roast on low heat till the outer cover is brown and crusty. Break open the balls and pour some fresh ghee on the halves. Serve hot with dal and pickles. Add 1 cup water and a pinch of turmeric and cook dal well. Mix all the spice powders in 1/2 cup water to make thin paste. Put ghee in a pan and heat. Splutter cumin & coriander seeds. Add ginger and the paste of spice powders. Fry for a minute, then mix in the dal. Add remaining water, salt and stir well. Note: Green gram dal can be substitued with tuvar dal too. Though both daal go well with baatis, the magic is mainly with preparation of baatis.